The next big Assassin's Creed game, Unity, looks like it's going to be very pretty and very French. Both are good things in my book—though given that I can't actually speak French and my last name is "LeJacq," I might be a tad biased. There's one thing we can all agree on, however: its PC requirements are insane. 50 GB of free hard drive space sounds like a lot, though that's fairly standard for Assassin's Creed-sized games at this point—as is the 8GB of RAM, and the base-level CPUs. What stands out to me are the minimum requirements for video cards. Making something like Nvidia's GeForce GTX 680 the base level requirements means that you'll pretty much have to be running a PC with a high-end GPU that came out in the past few years years. For a point of comparison, many of the season's other powerhouse titles like Call of Duty: Advanced Warfare or Middle-Earth: Shadow of Mordor have a base-level requirement of a GTS 450 or GTX 460 respectively. Lest we get caught in the illegible acronym-riddled weeds of graphics cards comparisons, the important thing to note here is that both of these other games say that you'll be able to play them with tech that's quite a bit older, and quite a bit cheaper, than what Assassin's Creed Unity is asking for. Granted, Unity is also a next-gen only game, and Ubisoft has promised that it will boast the biggest city ever seen in the series' history, so maybe the steep requirements will be worth it at the end of the day. In either case, Unity isn't out in the wild yet, so (as always), take Ubisoft's statement about its recommended specs with a grain of salt. 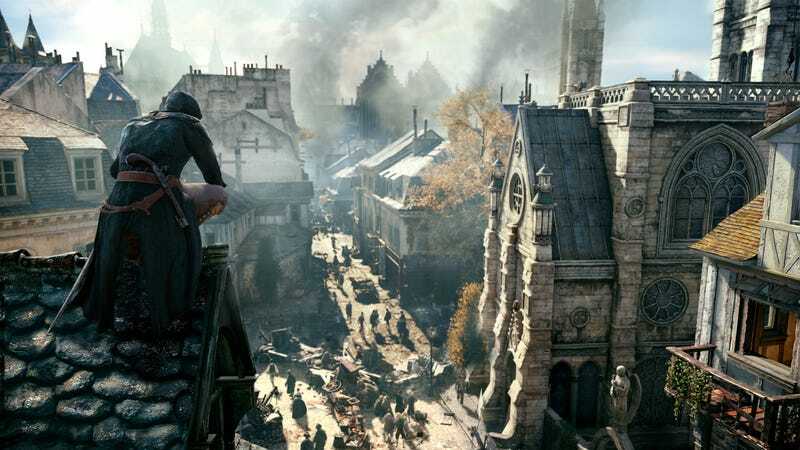 Come November, the PC gamers among us should also keep watchful eye on how Unity's performance is affected by whether its running on an AMD or Nvidia card, since Ubisoft inked a deal with the latter company that covers the new Assassin's Creed game—a deal that could prove to be fodder for yet another chapter in the card makers' ongoing tiff. UPDATE (5:05 pm): Some people have observed that my use of "très magnifique" in the headline isn't technically correct. I intended for this to be a joke. Seeing as I'm a semi-French person with an exceedingly French name who doesn't actually speak the language, however, I should have been more careful in my presentation. I apologize for misleading or confusing people unnecessarily.